Sorry for the delay in posting anything new -- a wicked nasty cold hit our home last week & knocked both children and myself out for a while. Coupled with the meltdown of my home laptop, it meant there was no joy in Cyber-land for me. Please note, if you have emailed me recently and I haven't responded yet, I'll be valiantly catching up over the next couple of days! Okay, back to our regularly schedule stamping programming! 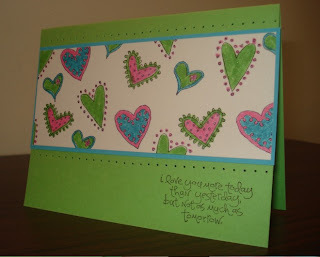 Here are the final 3 projects from the recent "Love Matters" class (the previous 2 cards were shared HERE). 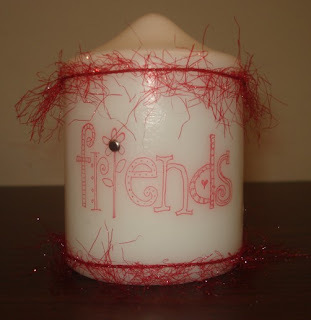 The candle is just something fun that I threw together -- I love how easy & WOW they can be to make! I used our Scarlet fibers and while the candle's wax was warm, I pushed through a silver brad. IF YOU WOULD LIKE A TUTORIAL ON CANDLES... please let me know in the comments below, and I'll see if I can do one for next week! 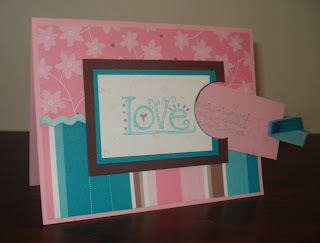 The final card was CASE'd from Jennie/mocjen's sample card (see her SCS gallery here). The main difference with her card & mine is that she used the rikrack from the Flirty ribbons set (I used mine on the previous card) and I chose to use the Shimmer White cardstock for the backing. You can't see it in the scan, but it gives a wonderful & subtle sparkle to the card. I love these cards. So bright and fun! I love the shimmer paper. Glad you are feeling better. Yes I missed you. Which was worse? The cold or lack of cyber space?